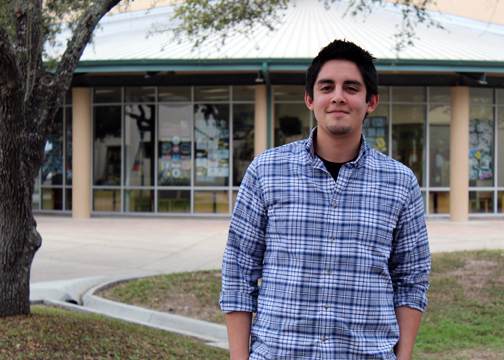 David Peña is an Engineering major at Texas State Technical College. He expects to graduate this semester with an associate degree. The 22-year-old, who also works as a work-study employee as a mentor with the TSTC Office of Student Success, said he is excited about his future and happy that he’s been able to grow and maintain a 3.8 grade-point average. After I graduate I plan on pursuing a career in engineering and eventually getting a bachelor’s degree in Electrical Engineering. My uncle is a senior foreman for an engineering team in Hawaii, and I hope to follow in his footsteps. My greatest accomplishment at TSTC has been maintaining my GPA. I was never an A student in high school, so I never expected to do this good in college, but TSTC has shown me that it’s possible. The greatest lesson I have learned is about resiliency. Before enrolling at TSTC my plan was to enlist in the Air Force, but due to a past surgery I was disqualified. It was a big disappointment for me to say the least, but because of resiliency I didn’t let the discouragement or struggles keep me down. Who at TSTC has had the most influence on your success? My mathematics instructor Scott Contois and engineering instructor Hermes Chirino have been my greatest influences. They are inspirational to their students, push us to pursue our passions and encourage our education. My advice for future TSTC students is to find a field and a career they are passionate about. Do more than just your basics at TSTC, complete an associate degree because there are programs that are going to bring so many opportunities to your lives. This entry was posted in Harlingen on March 18, 2019 by Amanda Sotelo Sotelo.